We previously talked about event décor and now we'd like to provide tips on how to decorate when it's your turn to host Thanksgiving dinner. There's more to think about than just the turkey and side dishes. Having stylish Thanksgiving table décor will definitely bring that "wow" factor and will keep your guests talking until next year. Whether it's the little DIY touches that show your creativity or memorable new décor, here are some tips on how to get your dining room table Thanksgiving-ready by Turkey Day. · Choose your favorite vase and create your own floral display. · Integrate the outdoors by including a variety of different foliage pieces. · From large orange pumpkins to mini gourds in every hue, get creative with a variety of festive trimmings. · Incorporate a plethora of candles and different kinds of lighting to brighten the evening. · Mix and match styles, such as pairing wood candlesticks with crystal vases. Although traditionally Thanksgiving décor comes in warmer hues, like browns, reds, and oranges, it's okay to branch out into different color palettes. There is no hard and fast rule that says you can't add in your favorite blue plates or the rose-colored china you got from your grandmother. Find that special something that reflects your distinct style. 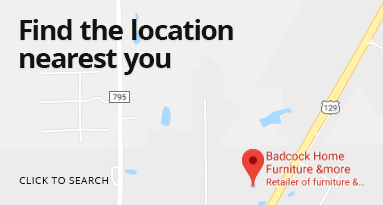 If your dining room table has seen better days or you're ready to invest in a new sideboard, turn to Badcock Home Furniture &more for all your furniture needs. We are here to make sure you have everything you require before it's time to host Thanksgiving dinner at your home. Browse our selection of furniture and home décor online or visit us at one of our many locations.